A glossary of key terms used in the validation of non-formal and informal learning. Source: Cedefop (2014). 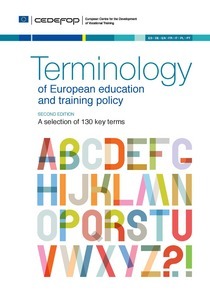 Terminology of European education and training policy: a selection of 130 terms. 2nd ed. Luxembourg: Publications Office. Process of appraising knowledge, know-how, skills and/or competences of an individual against predefined criteria (learning expectations, measurement of learning outcomes). Assessment is typically followed by certification. Comment: in the literature, ‘assessment’ generally refers to appraisal of individuals whereas ‘evaluation’ is more frequently used to describe appraisal of education and training methods or providers. A body issuing qualifications (certificates, diplomas or titles) formally recognising the learning outcomes (knowledge, skills and/or competences) of an individual, following an assessment procedure. An official document, issued by an awarding body, which records achievements of an individual following an assessment against a predefined standard. Source: Cedefop, 2001 in European Commission. Extent to which it is possible to establish equivalence between the level and content of qualifications (certificates, diplomas or titles) at sectoral, regional, national or international levels. Comment: comparability of qualifications improves individuals’ employability and mobility. This term must not be confused with ‘equivalence of qualifications’ (which refers the similarity of value of certificates or diplomas).. Source: Cedefop, Bjørnåvold, Tissot, 2000. Ability to apply learning outcomes adequately in a defined context (education, work, personal or professional development). Ability to use knowledge, skills and personal, social and/or methodological abilities, in work or study situations and in professional and personal development. Comment: competence is not limited to cognitive elements (involving the use of theory, concepts or tacit knowledge); it also encompasses functional aspects (including technical skills) as well as interpersonal attributes (e.g. social or organisational skills) and ethical values. Source: Cedefop; European Parliament and Council of the European Union, 2008. Comment: continuing education and training is part of lifelong learning and may encompass any kind of education (general, specialised or vocational, formal or non-formal, etc.). It is crucial for employability of individuals. Source: based on Ohlsson, 1994. Combination of factors which enable individuals to progress towards or get into employment, to stay in employment and to progress during their careers. Combination of factors which enable individuals to progress towards or get into employment, to stay in employment and to progress during their careers. Source: Cedefop, 2008, based on Scottish Executive, 2007; The Institute for Employment Studies, 2007. Portfolio of five documents helping citizens to better communicate their skills and qualifications when applying for job or study in Europe. The Europass CV and the Language Passport are completed by citizens themselves; the other three documents can be issued to citizens who achieve a mobility experience in another European country (Europass Mobility) or who complete a formal programme of vocational education or training (Certificate supplement) or of higher education (Diploma supplement). Comment: Europass promotes an adequate appreciation of learning outcomes acquired in formal, non-formal or informal settings. Technical framework for transfer, validation and, where appropriate, accumulation of learning outcomes by individuals, to achieve a qualification. ECVET tools and methodology comprise a description of qualifications in units of learning outcomes with associated points, a transfer and accumulation process and complementary documents such as learning agreements, transcripts of records and ECVET users’ guides. common trust and cooperation between providers of vocational training and education in Europe. EVET is based on the description of qualifications in terms of learning outcomes (knowledge, skills and/or competencies), organised into transferable and accumulable learning units to which credit points are attached and registered in a personal transcript of learning outcomes. Source: Cedefop; European Parliament and Council of the European Union, 2009a. Help universities to organise and revise their study programmes. Comment: ECTS is based on the student workload required to achieve a programme’s objectives, specified in terms of learning outcomes to be acquired. The student workload of a full-time study programme in Europe amounts in most cases to around 1500 to 1800 hours per year and in these cases one credit stands for around 25 to 30 hours. Individuals who can demonstrate similar learning outcomes acquired in other learning settings may obtain recognition and credits (waivers) from degree awarding bodies. Source: Cedefop. 2008, based on European Commission, 2004. Reference tool for describing and comparing qualification levels in qualifications systems developed at national, international or sectoral levels. Comment: the EQF’s main components are a set of eight reference levels described in terms of learning outcomes (a combination of knowledge, skills and/or competences) and mechanisms and principles for voluntary cooperation. The eight levels cover the entire span of qualifications from those recognising basic knowledge, skills and competences, to those awarded at the highest level of academic, professional and vocational education and training. EQF is a translation device for qualification systems. Source: based on European Parliament and Council of the European Union, 2008. Learning that occurs in an organised and structured environment (such as in an education or training institution or on the job) and is explicitly designated as learning (in terms of objectives, time or resources). Formal learning is intentional from the learner’s point of view. It typically leads to certification. guidance and counselling can be provided at schools, training centres, job centres, the workplace, the community or in other settings. Informal learning is also referred to as experiential or incidental/random learning. General or vocational education and training carried out in the initial education system, usually before entering working life. Initial education and training can be carried out at any level in general or vocational education (full-time school-based or alternance training) or apprenticeship pathways. Comment: learning occurs through personal reflection, reconstruction and social interaction. It may take place in formal, non-formal or informal settings. Statements of what a learner knows, understands and is able to do on completion of learning process, which are defined in terms of knowledge, skills and competence. All learning activity undertaken throughout life, with the aim of improving knowledge, skills/competences and/or qualifications for personal, social and/or professional reasons. and/orthe requirements for an individual to enter, or progress within an occupation. All learning activity undertaken through life, which results in improving knowledge, know-how, skills, competences and/or qualifications for personal, social and/or professional reasons. Training enabling individuals to acquire new skills giving access either to a new occupation or to new professional activities. Ability to apply knowledge and use know-how to compete tasks and solve problems. Situation of imbalance in which the level or type of skills available does nto correspond to labour market needs. experts distinguish between vertical mismatch (the level of education/skills matches job requirements, but the type of education/skills is inappropriate for the current job). Comment: this term is also used in the literature to describe situations where physical or mental abilities and skills deteriorate due to atrophy or wear and tear. Source: Cedefop; De Grip, A.; van Loo, J. (2007). Source: Cedefop, 2008, based on Code du travail français, 2003. Process of exchange between social partners to promote consultation, and collective bargaining. at international level, social dialogue can be bilateral, trilateral or multilateral, according to the number of countries involved. Integration of individuals - or groups of individuals - into society, as citizens or as members of various public social networks. Social inclusion is fundamentally rooted in economic or labour market inclusion. Degree of visibility and legibility of qualifications, their content and value on the (sectoral, regional, national or international) labour market and in education and training systems. Source: Cedefop, 2008; Council of the European Uion, 2012. Source: Cedefop, 2001 in European Commission, 2001. Education and training which aims to equip people with knowledge, know-how, skills and/or competences required in particular occupation or more broadly on the labour market. Source: adapted from European Training Foundation, 1997.